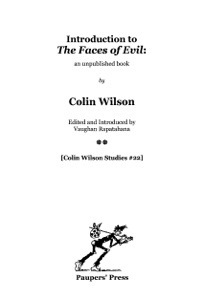 A previously unpublished essay by Colin Wilson is released on October 14th, at £8.95 (£7.95 for pre-orders, including free post within the UK). Order direct from Paupers’ Press. The book did not appear in print and all that remains is the substantial Introduction—over 80 pages in manuscript—written by Wilson and recently retrieved from an archive by Wilson scholar Vaughan Rapatahana. Colin Wilson 1931 – 2013. Thanks for your kind words & your support – all very appreciated.